Imagine new ways to discover distant planets, innovative tools to develop more effective cancer-fighting drugs, or even the opportunity to conduct teleportation. These are some of the endless possibilities through the power of quantum computing, according to experts. Yes, the realization of these aspirations may seem off in the distant future, but experimenting with the technology is very much in the present day for some Laurier students. "We were assigned an open-ended project. A lot of my classmates were interested in math-based theory work, which I don’t mind, but I was interested in doing something more applied," says Gareth Sharpe, a fourth-year Computer Science student at Laurier. "I asked my group if they’d be interested in doing something computational and we all agreed on it." Sharpe is referring to his final project for a senior-year elective course on quantum computing through Laurier’s Department of Physics and Computer Science. "The course introduces students to the fundamentals and important quantum algorithms for tasks such as factoring, searching, encryption and teleportation," says Shohini Ghose, Laurier professor of Physics and Computer Science, who taught the course. "It prepares students for future careers not just in academia but also in the growing quantum tech industry." 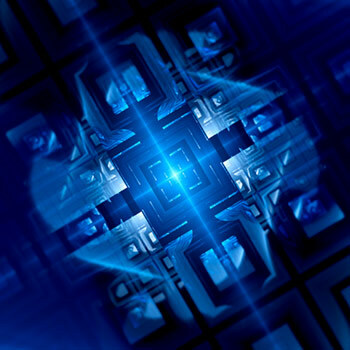 Sharpe, along with his classmates and fellow Computer Science majors Ryan Shanks and Umar Mahazudin, found that IBM had created the first cloud-based programmable quantum computer. They saw it as an ideal opportunity to apply their class-based learning by creating quantum circuits and running quantum algorithms. "You connect to the IBM quantum computer online, run algorithms and analyze the results," says Sharpe. "Professor Ghose was really supportive and said, 'Go for it!'" In contrast to classical computing, which uses zeros and ones to build strings and scripts, quantum computing has qubits — a unit of quantum information — that can be in the state of zero, one and also some gradient of probability between zero and one. Quantum theory has been labelled the next major revolution in information processing — and quantum information science experts like Ghose are studying how the laws of quantum physics can be harnessed to transform computation and communication, and to develop novel tasks such as teleportation. Shanks was amazed that a quantum computer was available for him to use. "It's small and partly prone to errors, but I thought it was 10 years away," says Shanks. According to IBM, there have been over 275,000 experiments by 40,000 users on the platform. Because the IBM quantum computer is universal, users can run any number of algorithms as long as they only use five qubits. "This course sounded interesting and was more abstract than a lot of other computer science courses I’ve taken," says Shanks. "I'd recommend the course to anyone who’s interested in quantum, which could be the future of computing. It was all new to me and was really fascinating to explore." Ghose was impressed with her students' originality. "Their ability to take their classroom learning and apply it to implement novel protocols such as teleportation was very impressive," she says. "It took real skill, effort and ingenuity to be able to successfully work with the IBM quantum computer given that the system is very new." Find out more about Physics and Computer Science at Laurier.